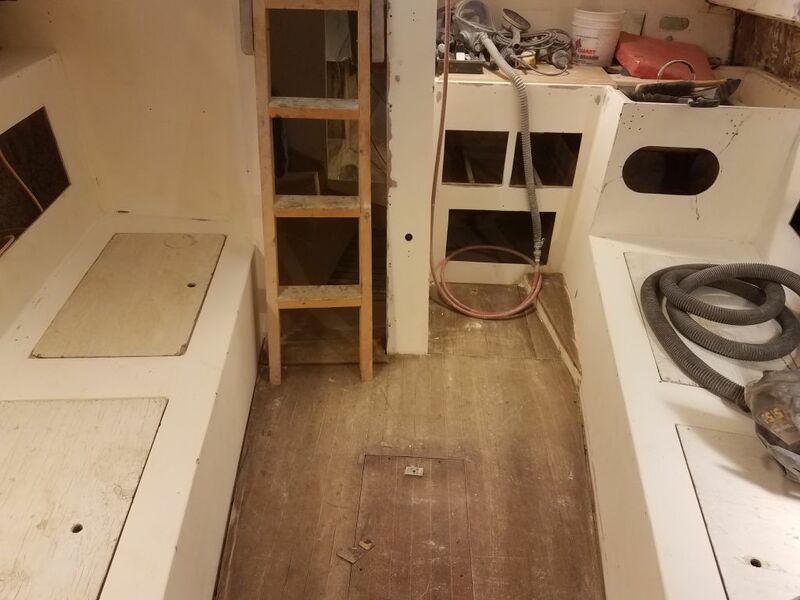 In the forward cabin, I removed the tall hanging lockers at the aft end of each berth. 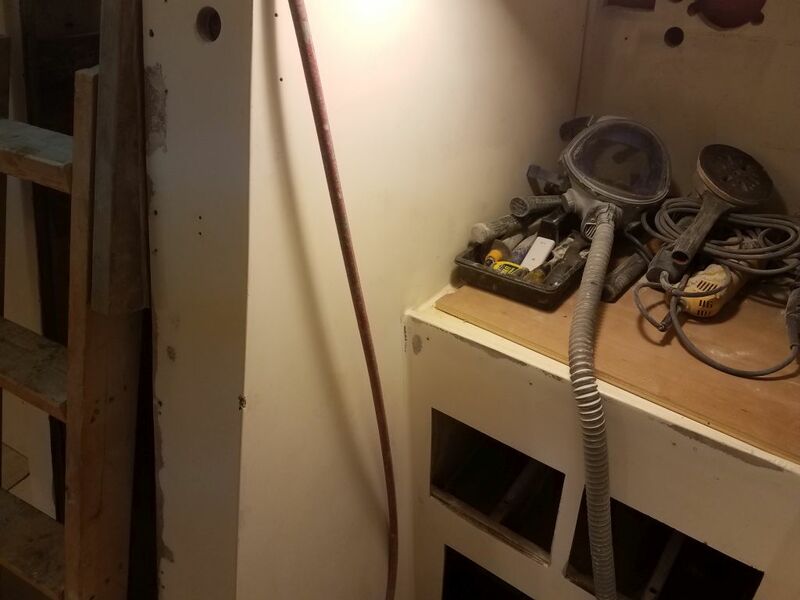 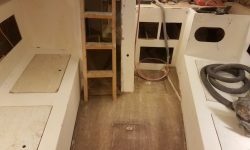 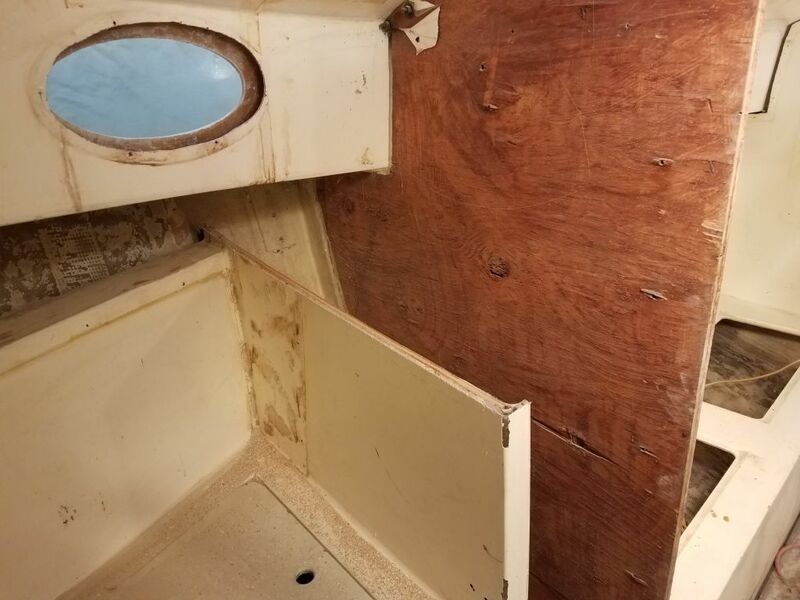 I used a saw to cut along the intersection of these lockers with the sides of the v-berth liner, and along the edge of the berth top, leaving a bit of an edge that I’d clean up and make flush later with additional sanding. 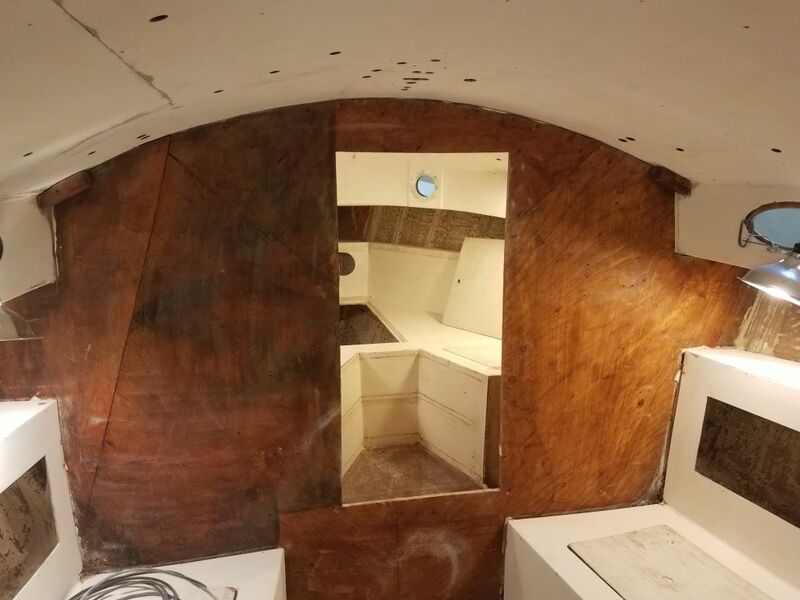 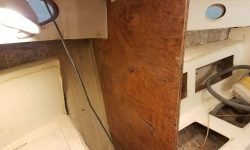 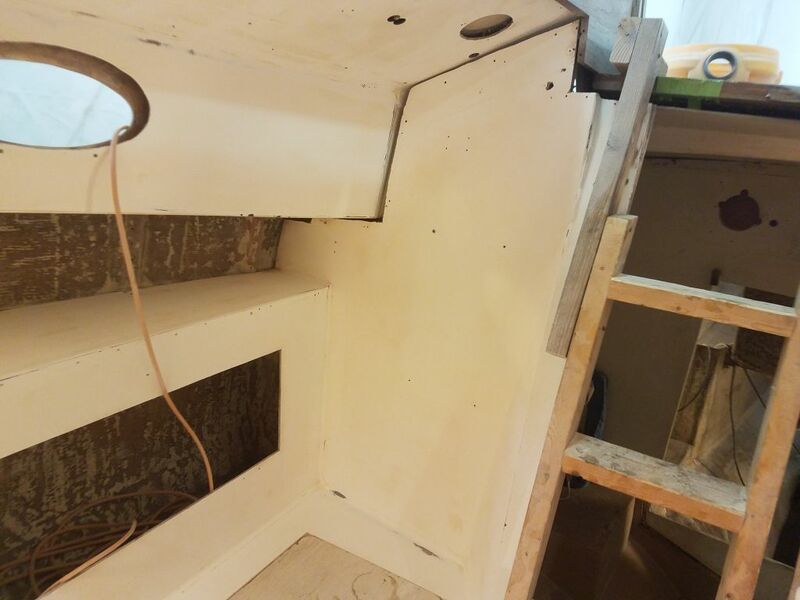 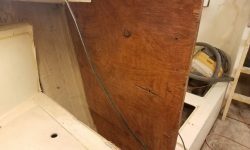 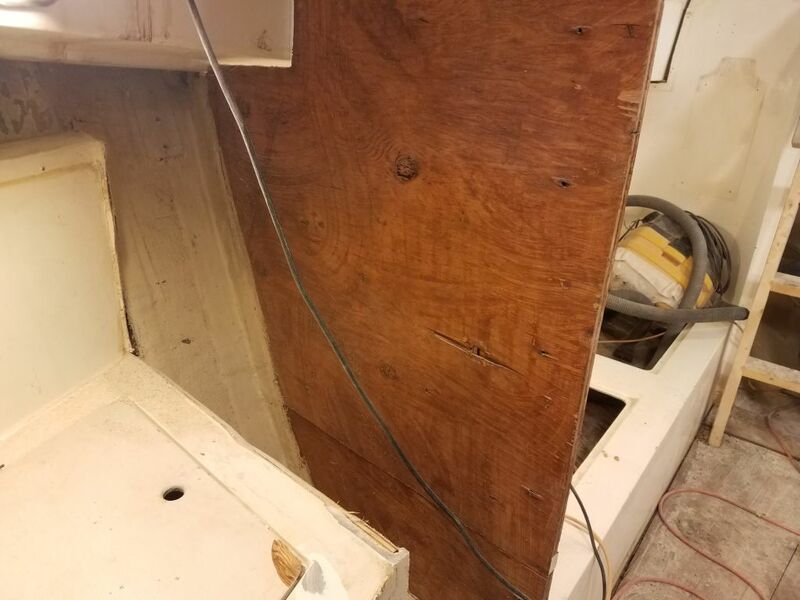 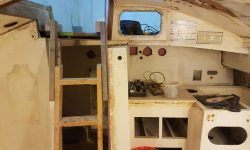 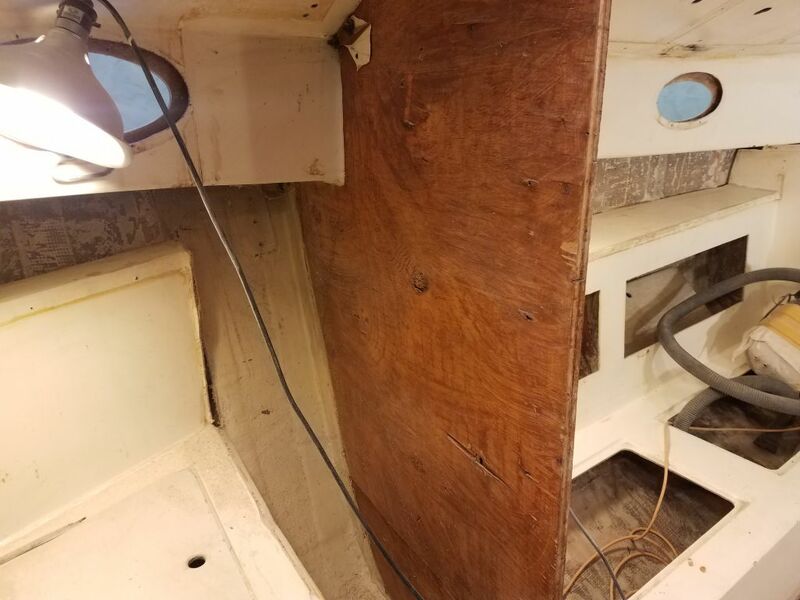 I cut out the lockers in a few sections to keep the size manageable, and removed remnants of the old tabbing along the hull sides to finish up the removal for now. 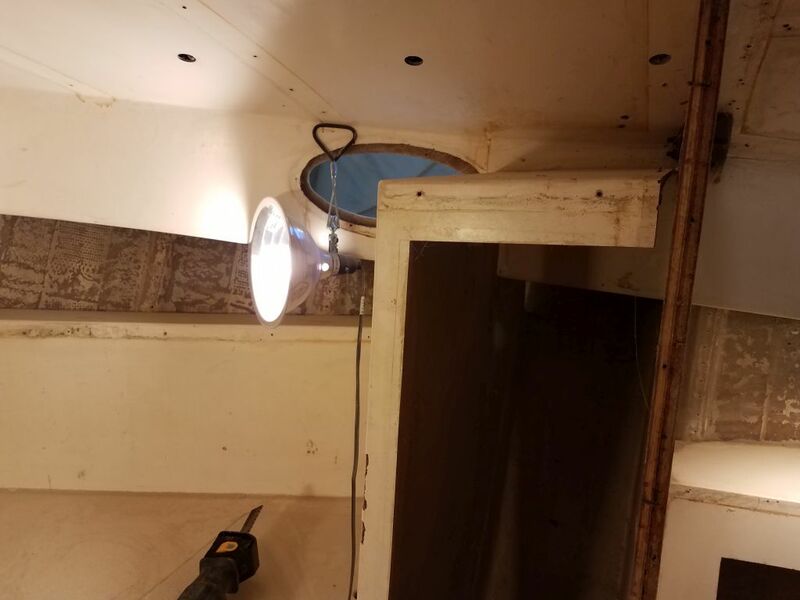 Removing the lockers greatly opened up and enhanced the space, and allowed decent access to the inside of the hull and forwardmost chainplate locations, and would greatly streamline further work efforts in the near future. 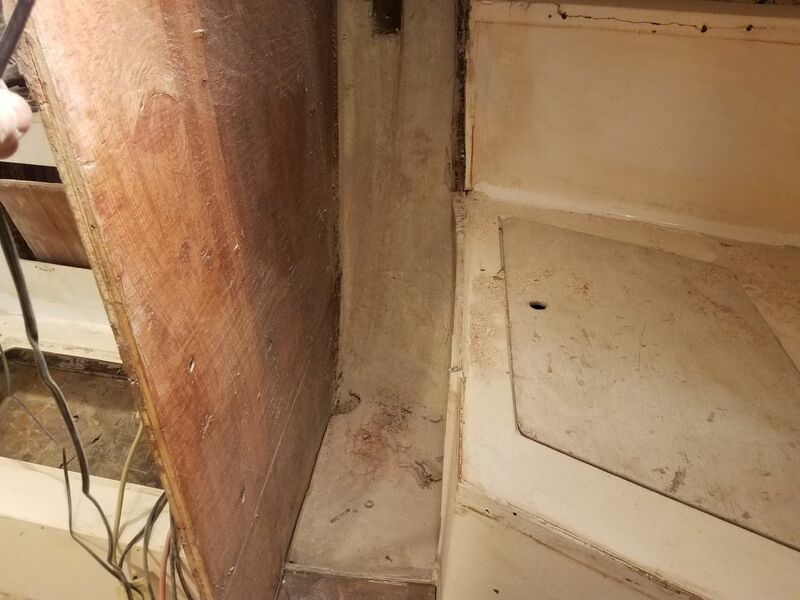 For now, I wasn’t sure how the owner wanted to finish off the space, but we’d discuss it during an upcoming meeting at the boat. 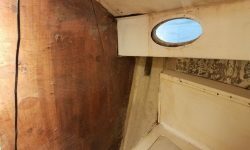 I’d soon clean up the areas with additional sanding, but for right now I planned to focus the rest of the day in the main cabin. 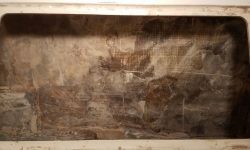 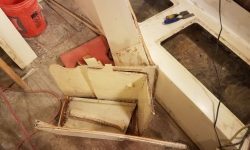 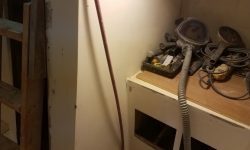 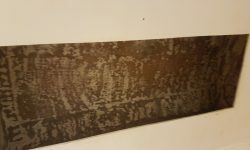 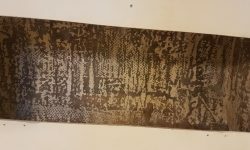 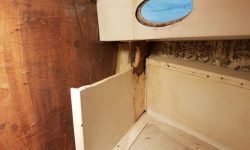 I turned back to the lockers beneath the settees, particularly on the port side, where I removed the rest of the core from the area with a grinder; I’d tried prying and scraping it, but found it too time-consuming. 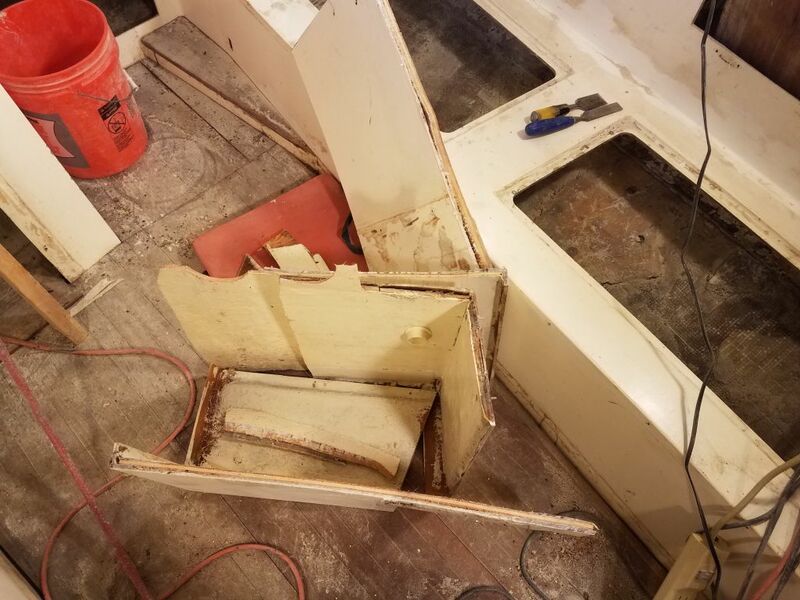 With one remaining sanding disc on the grinder, I ground away the remaining square foot or so of core, and lightly cleaned up the lockers on both sides. 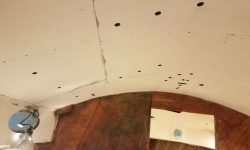 There was more and better sanding still to come soon, but I needed a new supply of the sanding discs first. 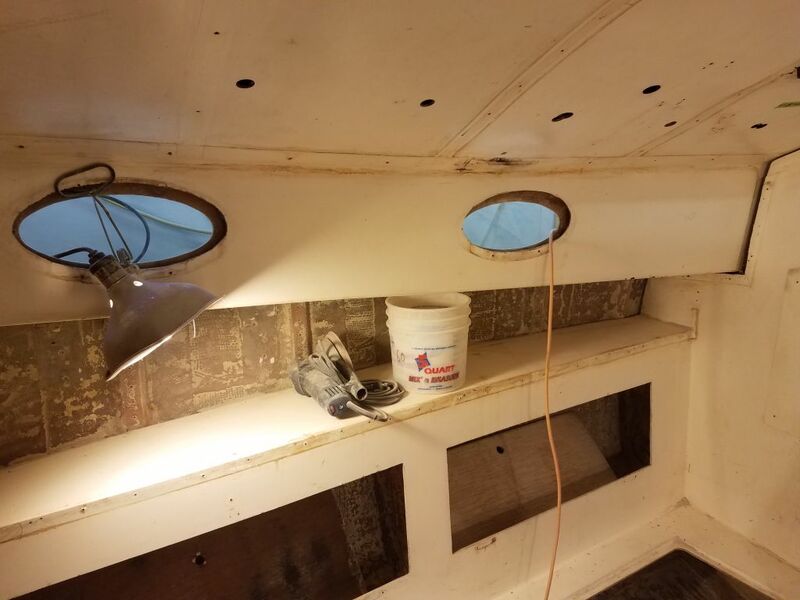 During the remainder of the day, I sanded all the gelcoated surfaces in the main cabin and galley, removing gloss from the gelcoat and, where necessary, removing that nasty old paint. 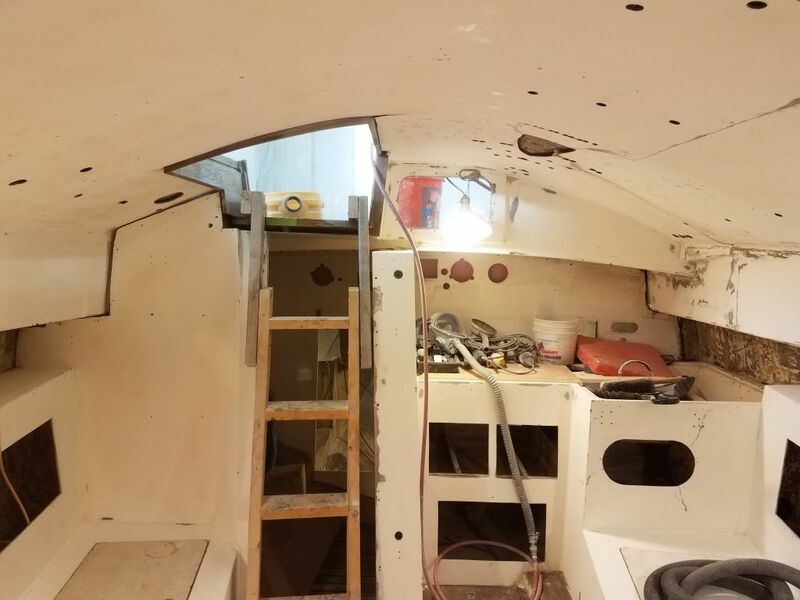 This included all areas of the settees and backrests, the galley and companionway areas, the underside of the bridgedeck, and the undersides of the sidedecks. 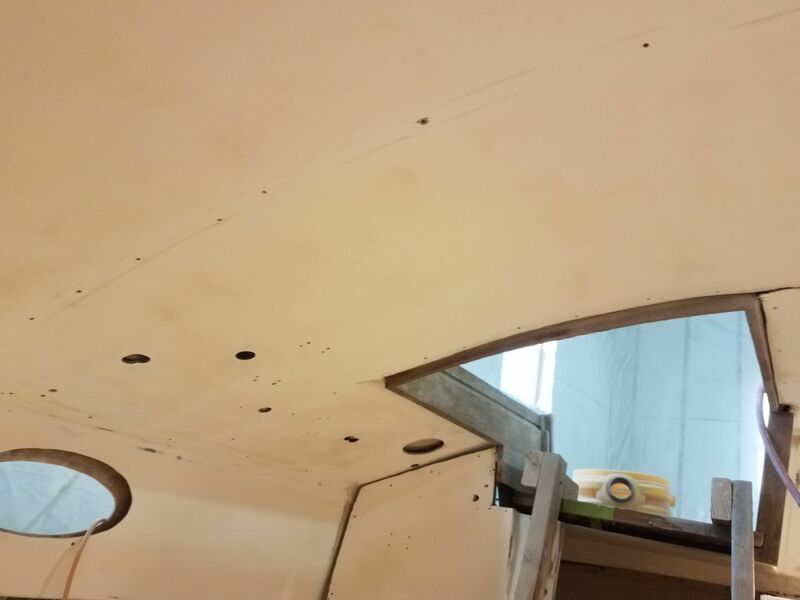 This initial round of sanding was a sort of initial cleaning pass, and I planned additional finish sanding soon to take care of final surface prep for primer as well as deal with detail areas and corners. 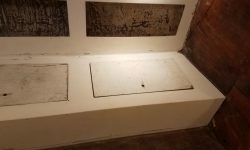 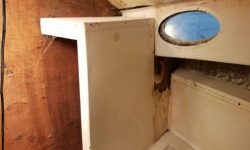 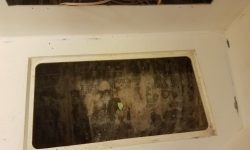 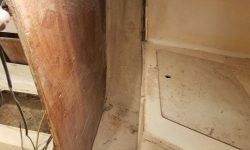 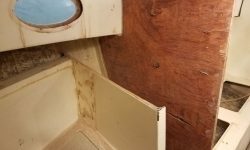 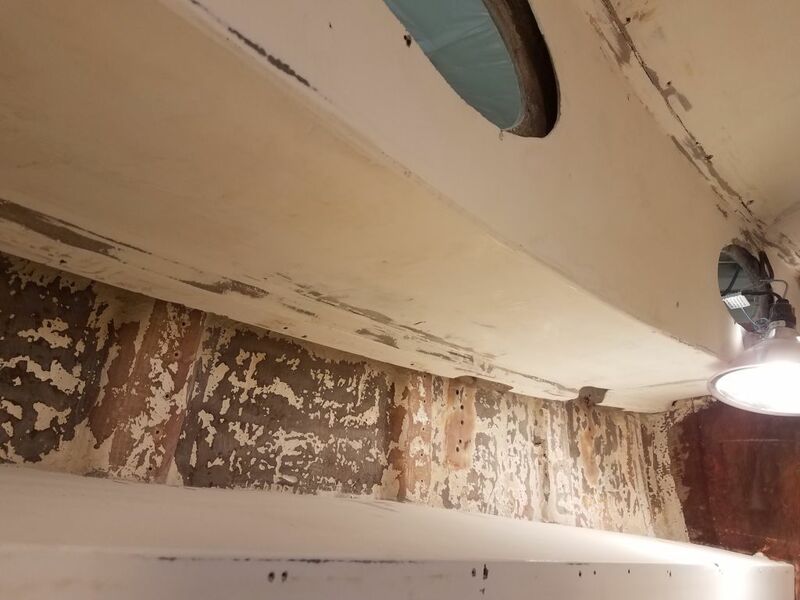 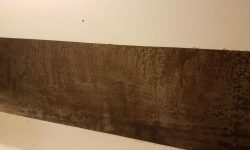 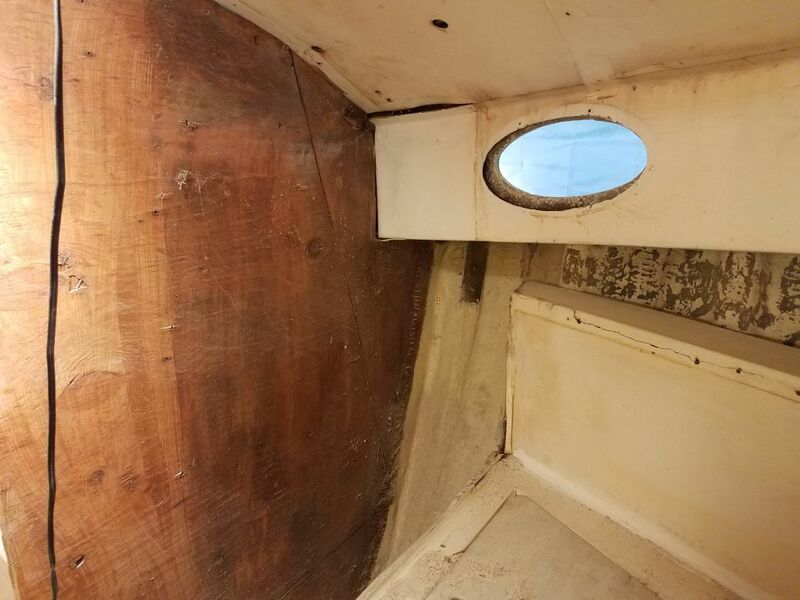 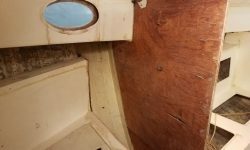 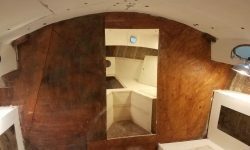 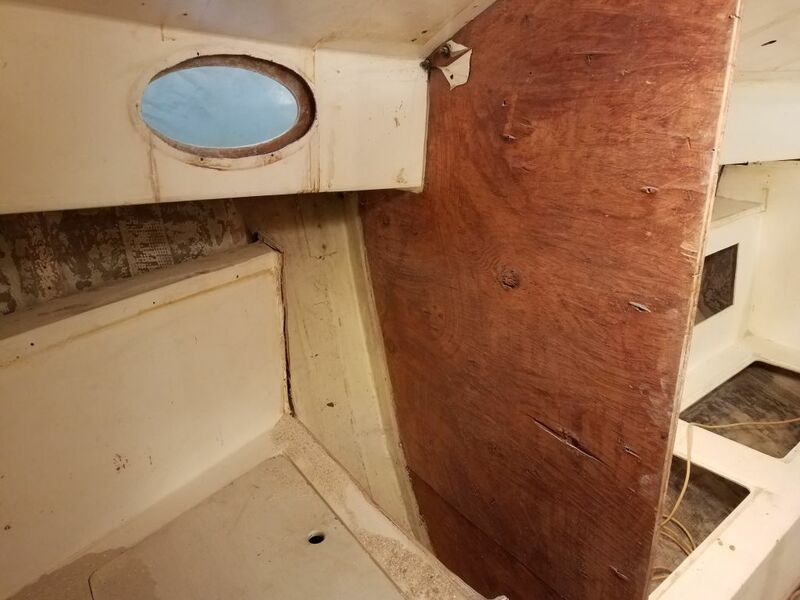 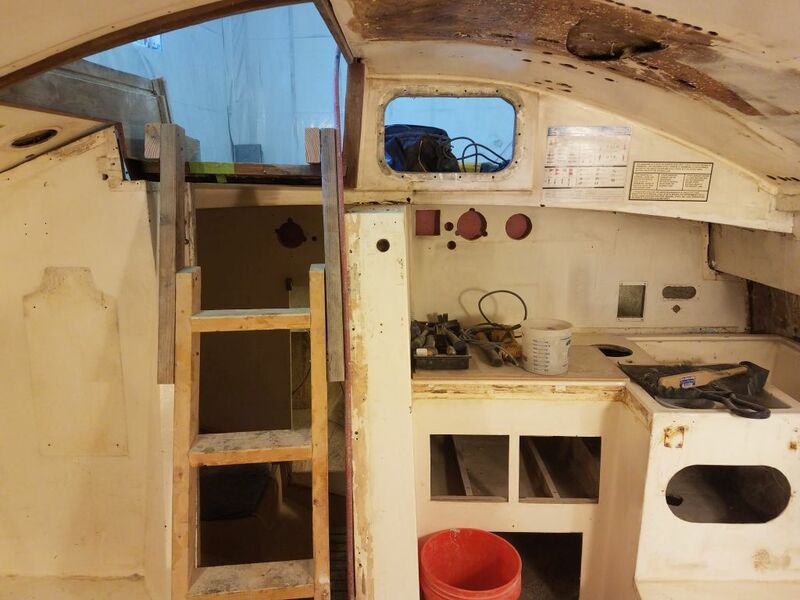 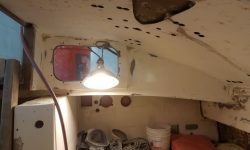 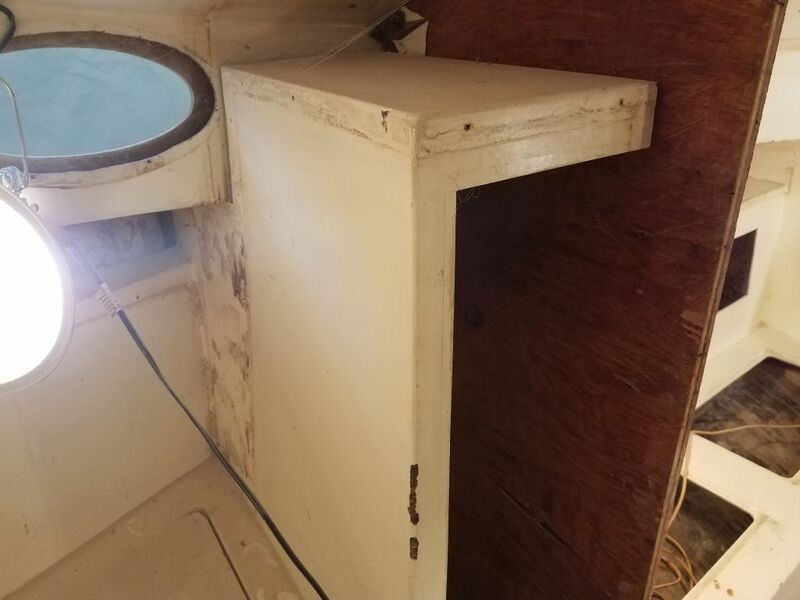 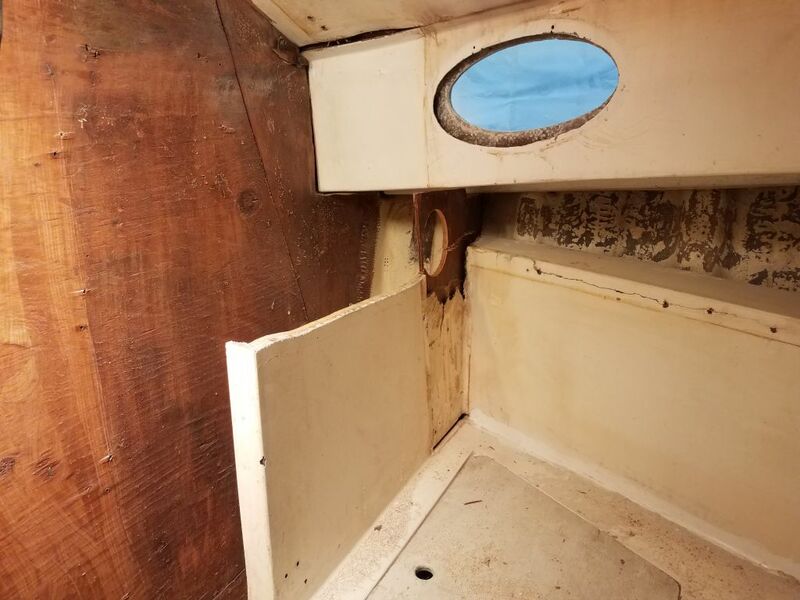 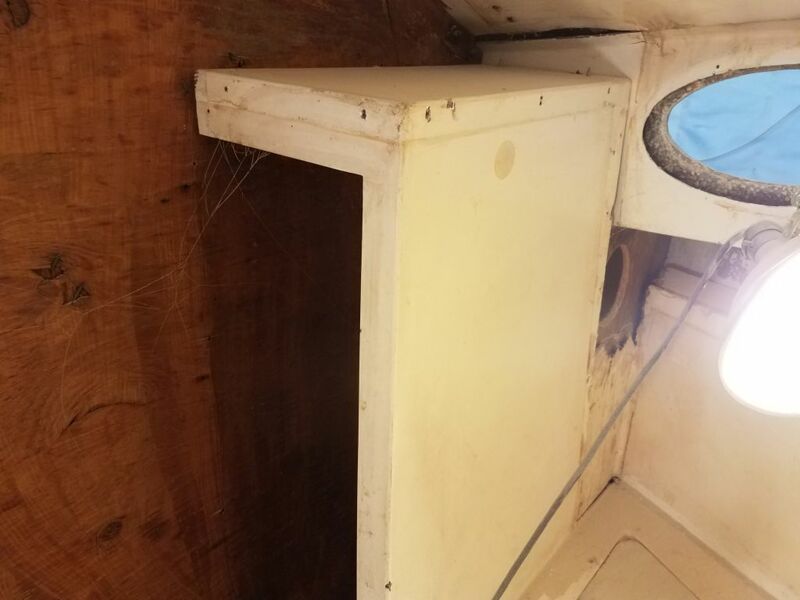 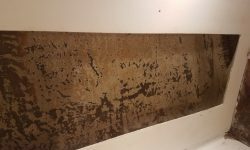 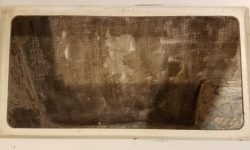 The large bulkhead aft of the galley was still covered with well-stuck Formica and didn’t receive any attention at this time. 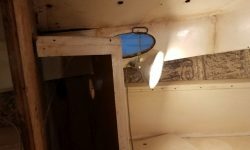 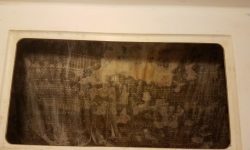 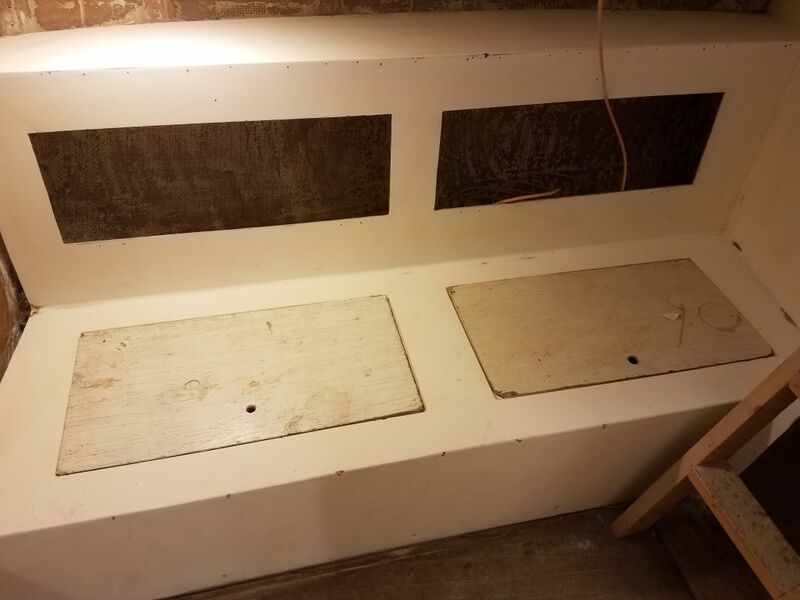 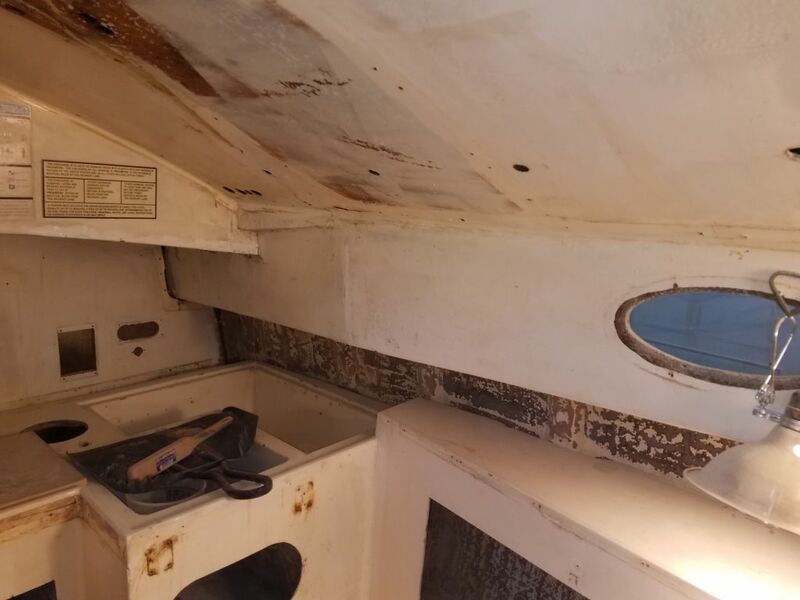 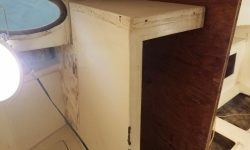 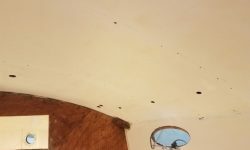 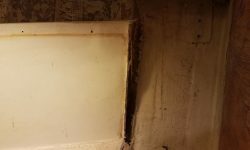 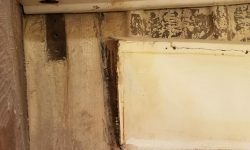 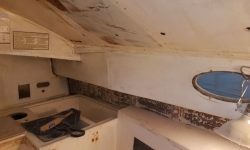 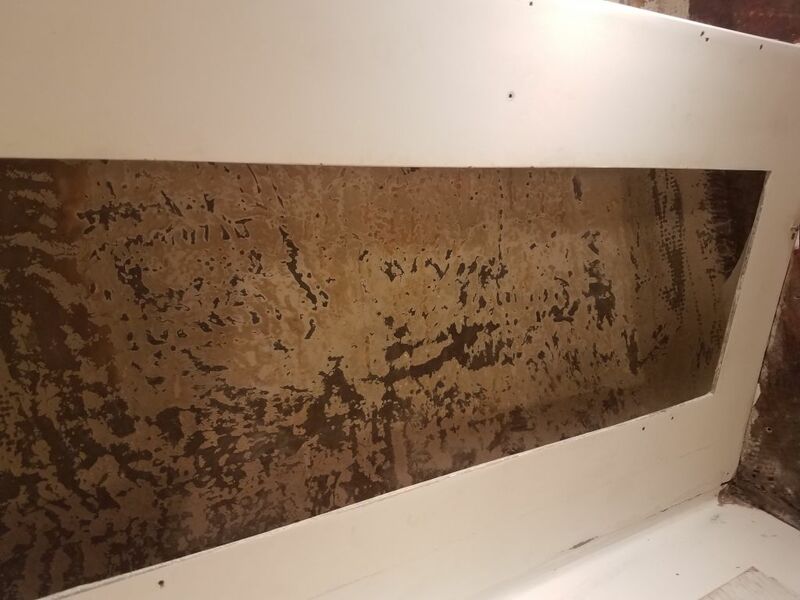 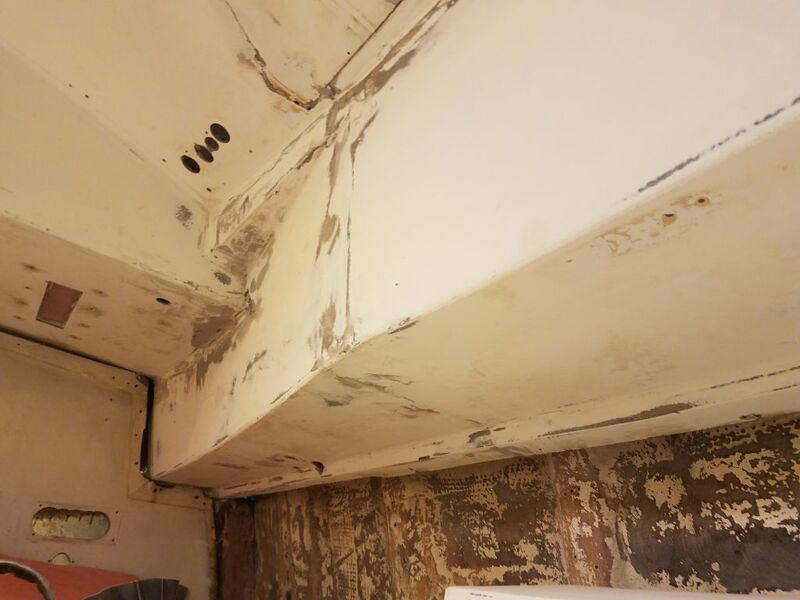 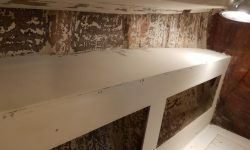 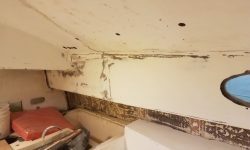 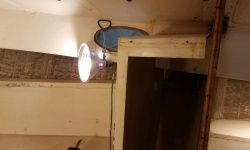 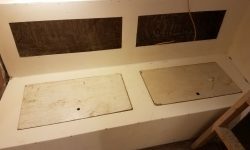 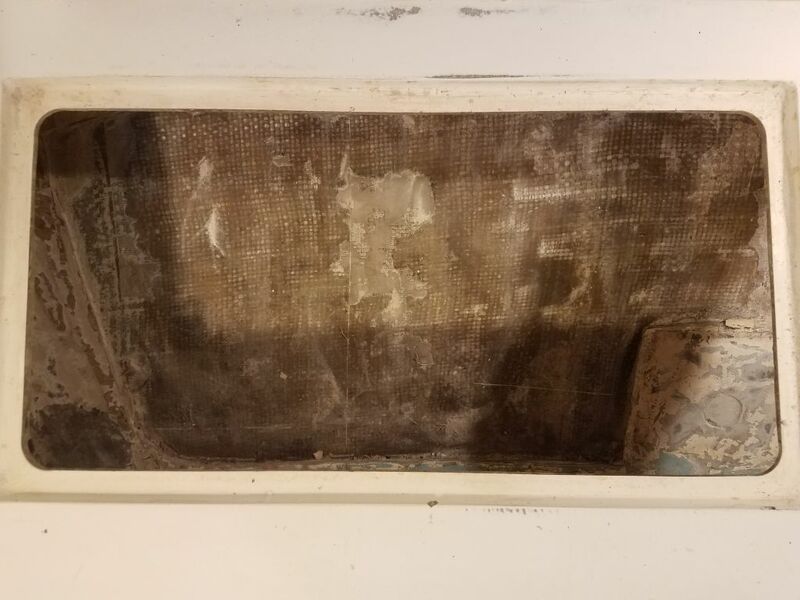 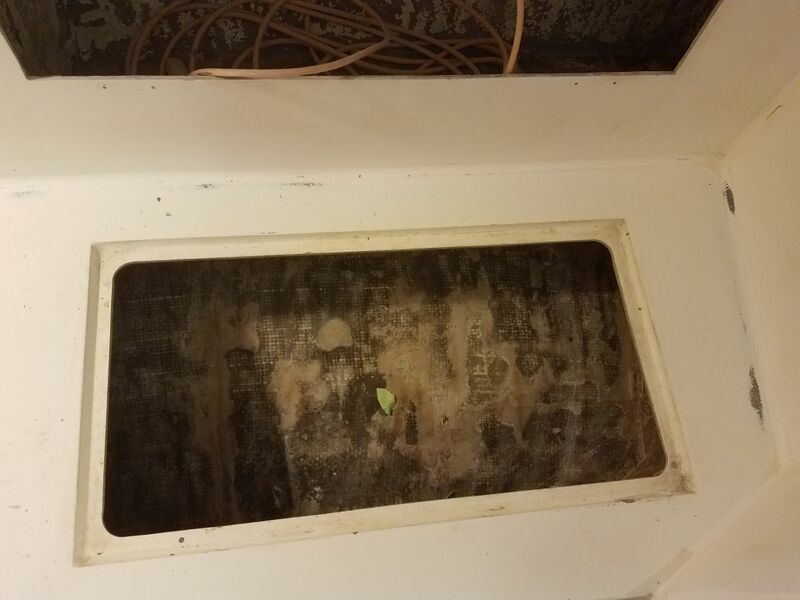 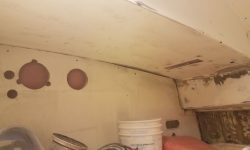 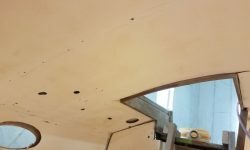 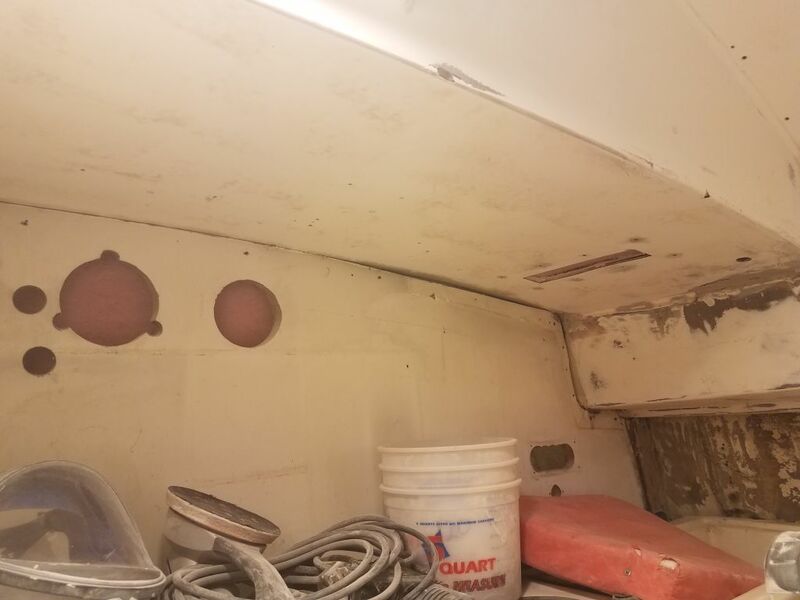 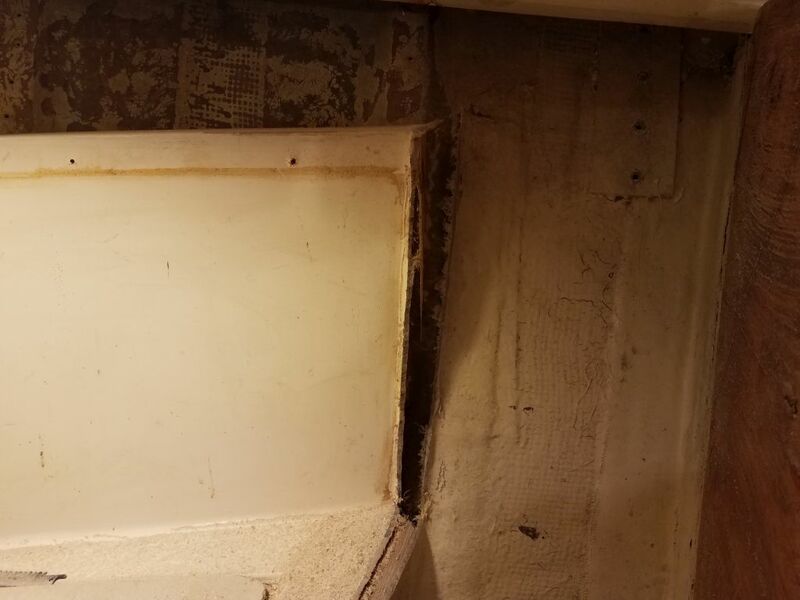 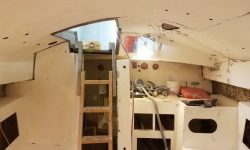 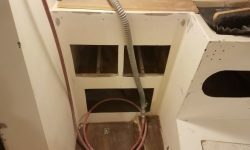 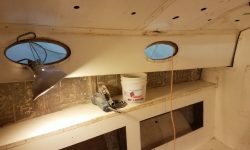 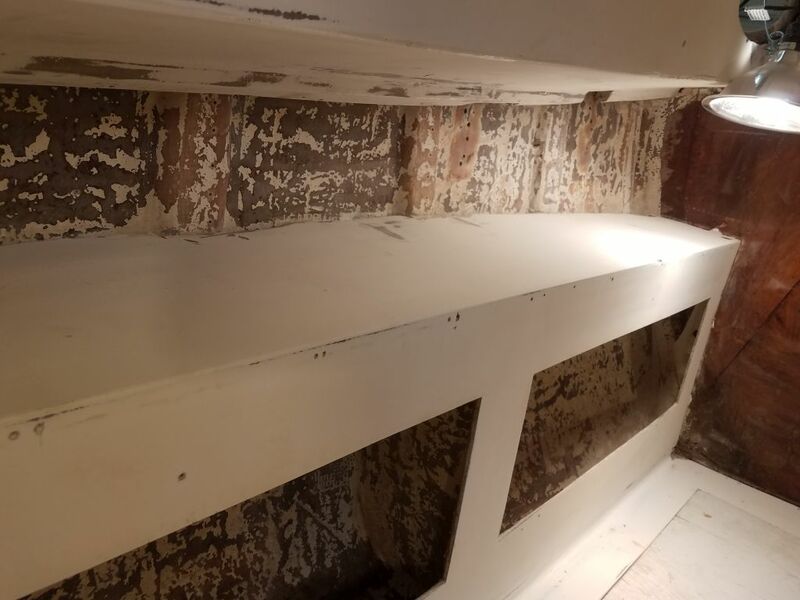 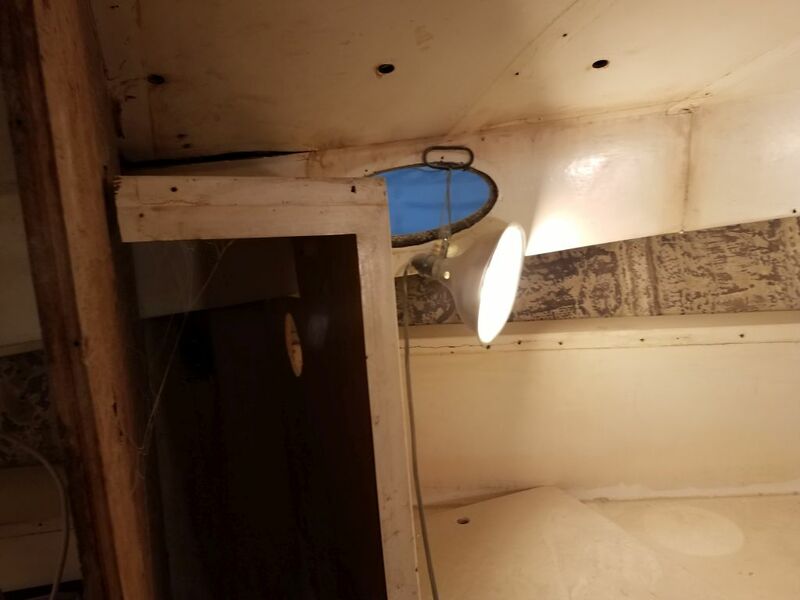 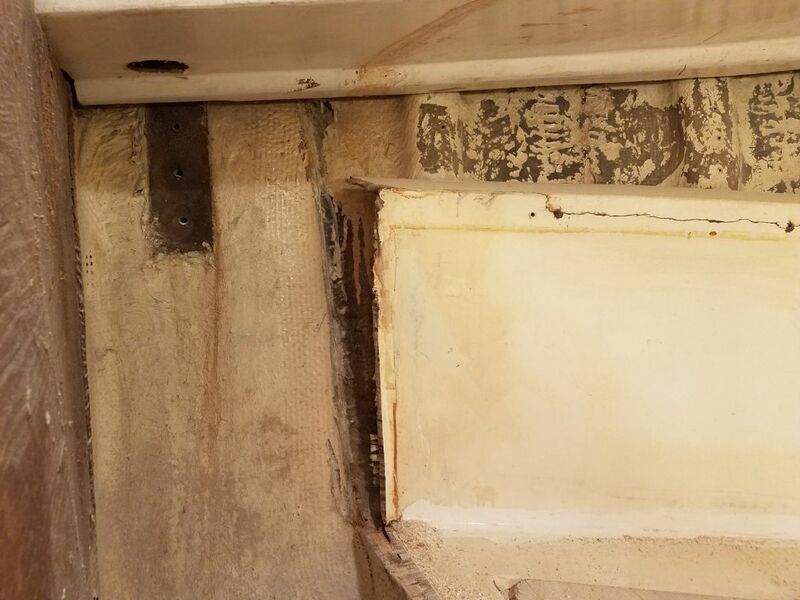 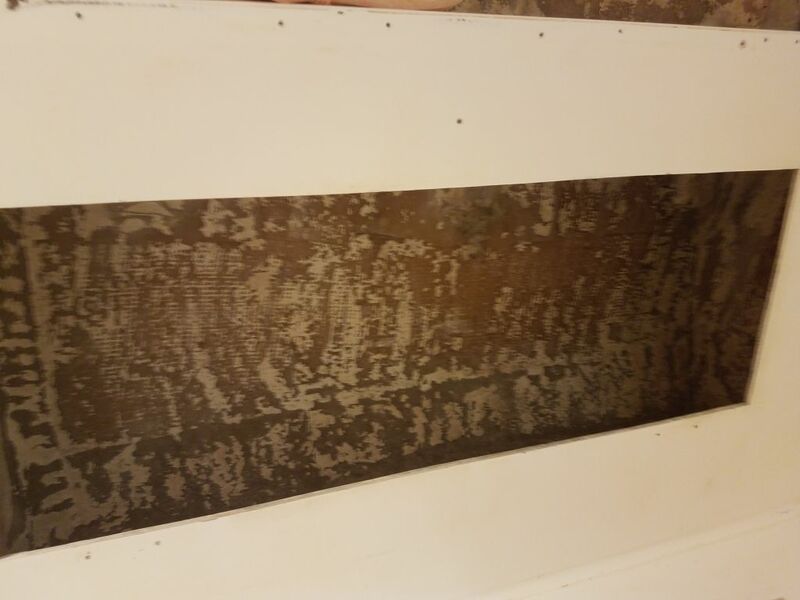 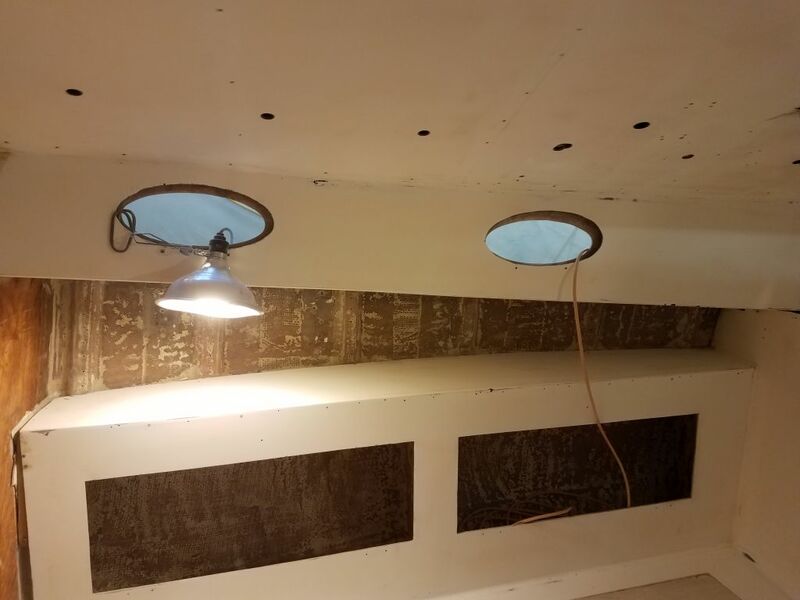 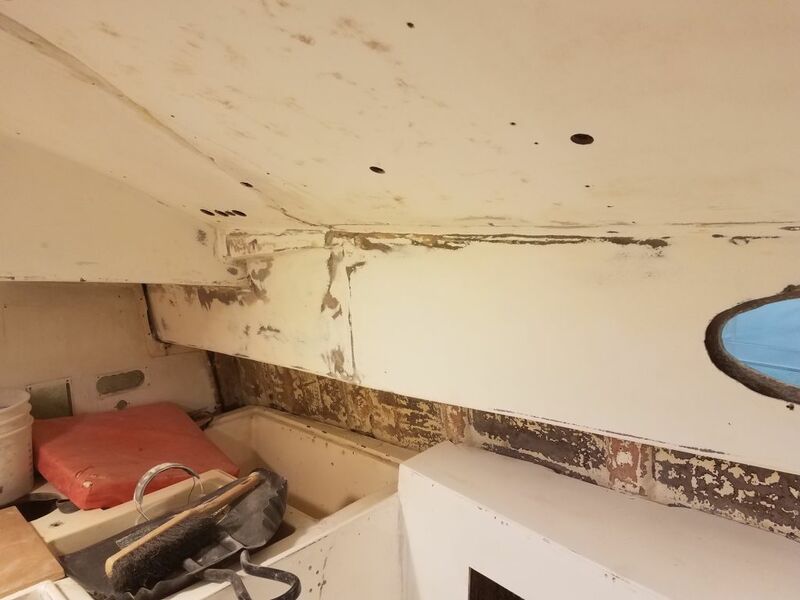 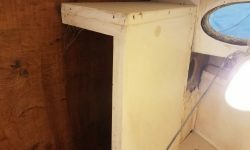 In some areas, I had to remove hated silicone sealant residue, which the builders had used beneath some of the trim and around the large port above the galley. 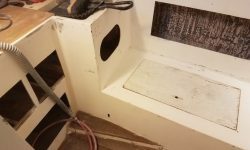 It was like sanding a car tire, but I prevailed. 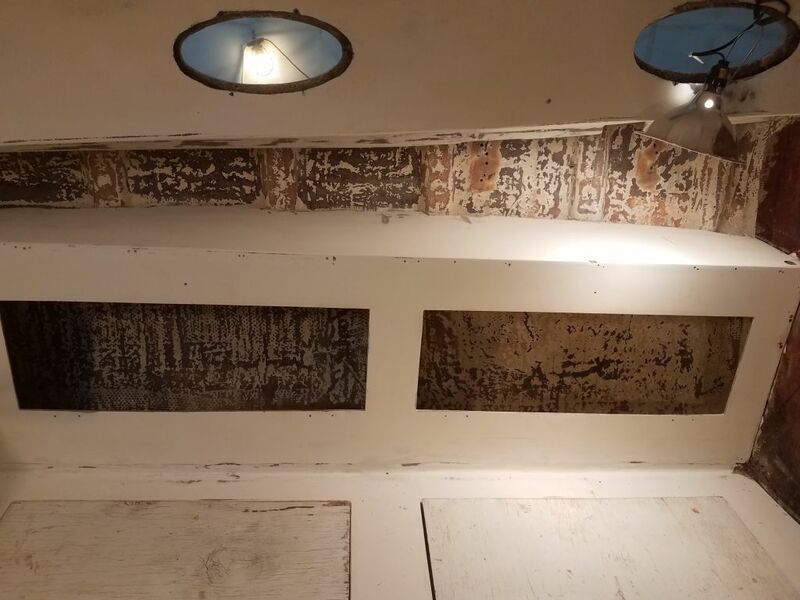 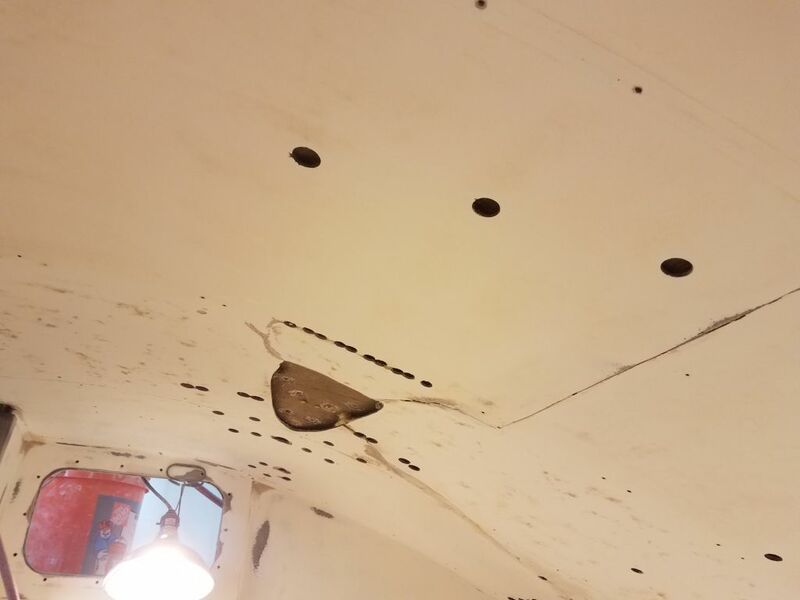 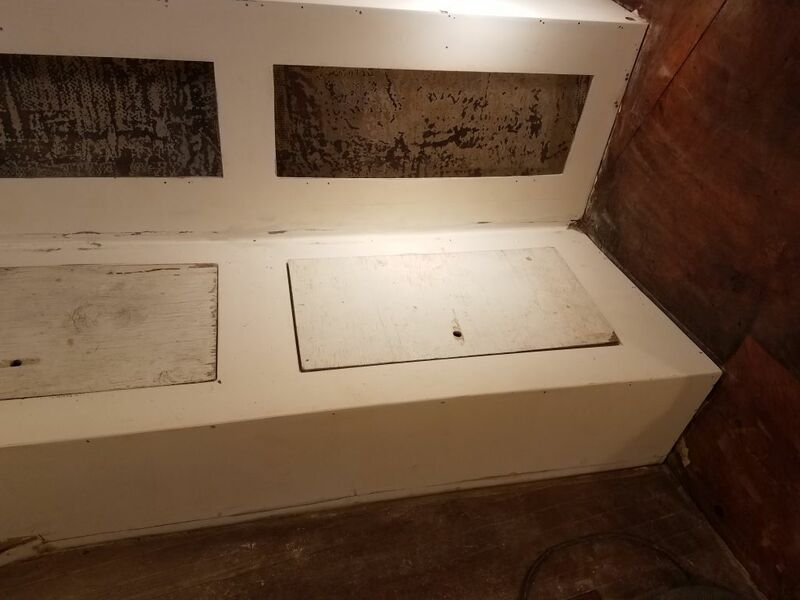 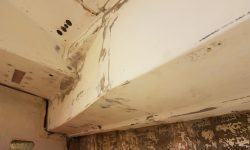 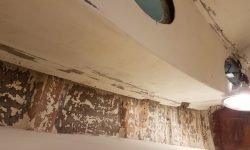 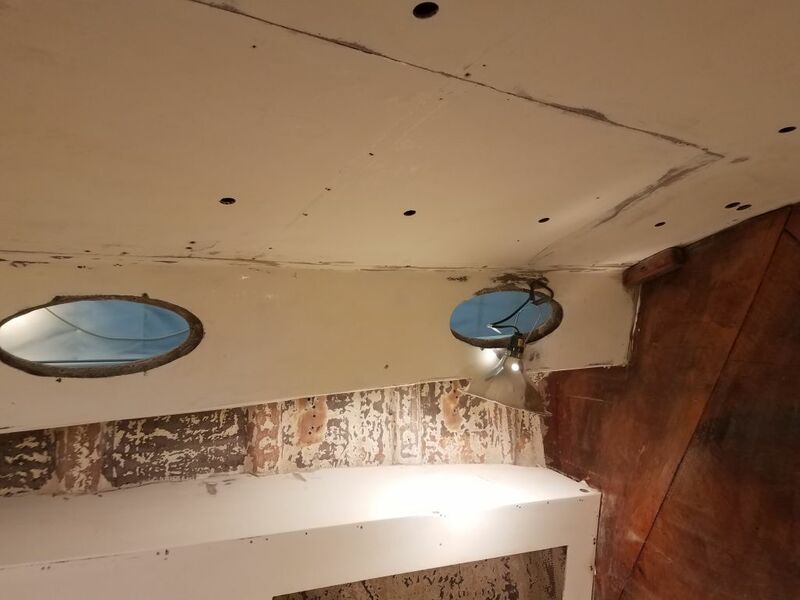 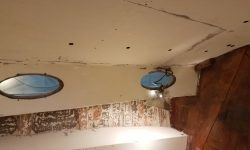 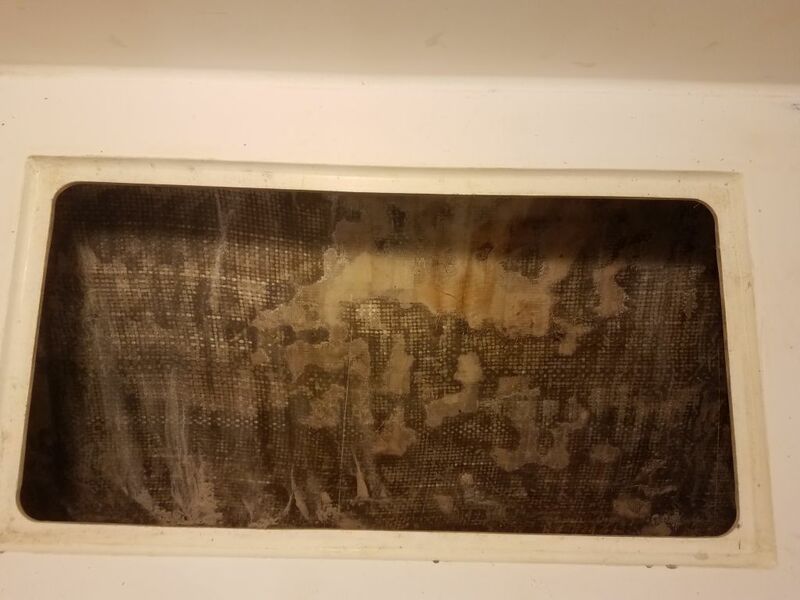 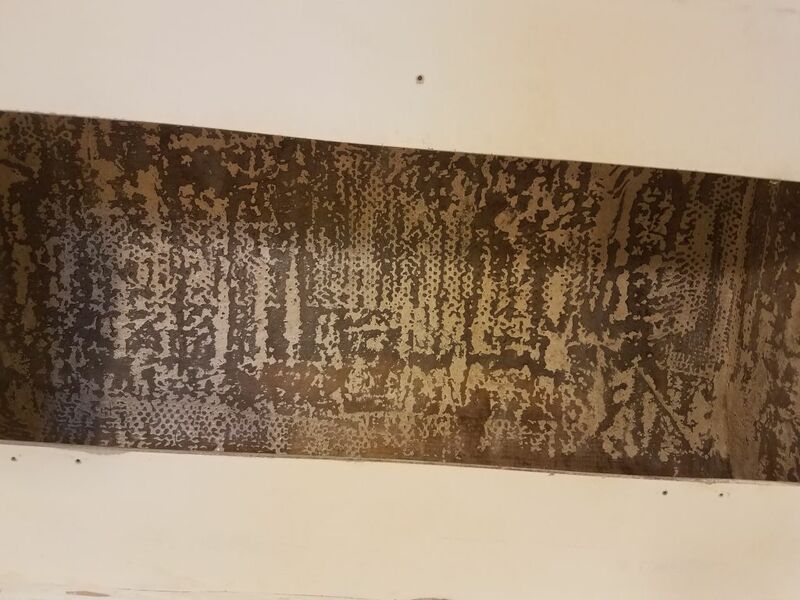 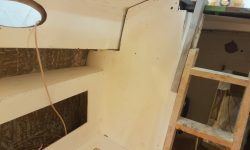 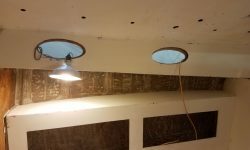 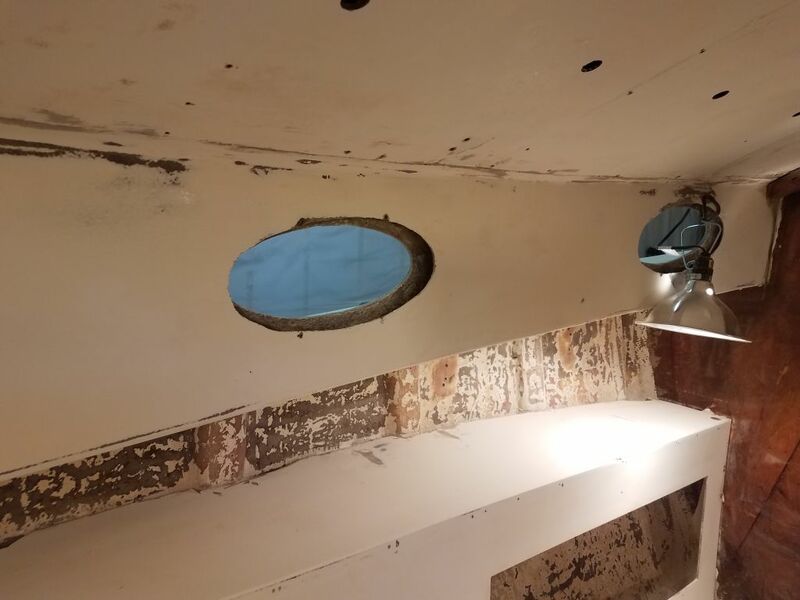 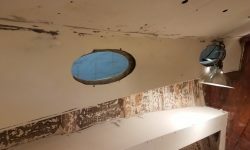 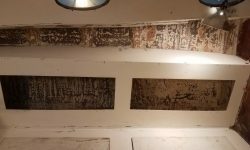 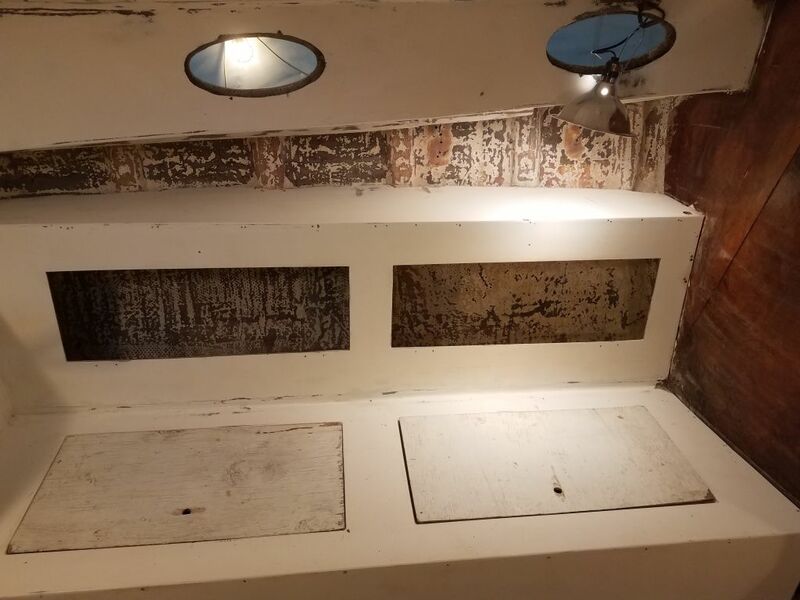 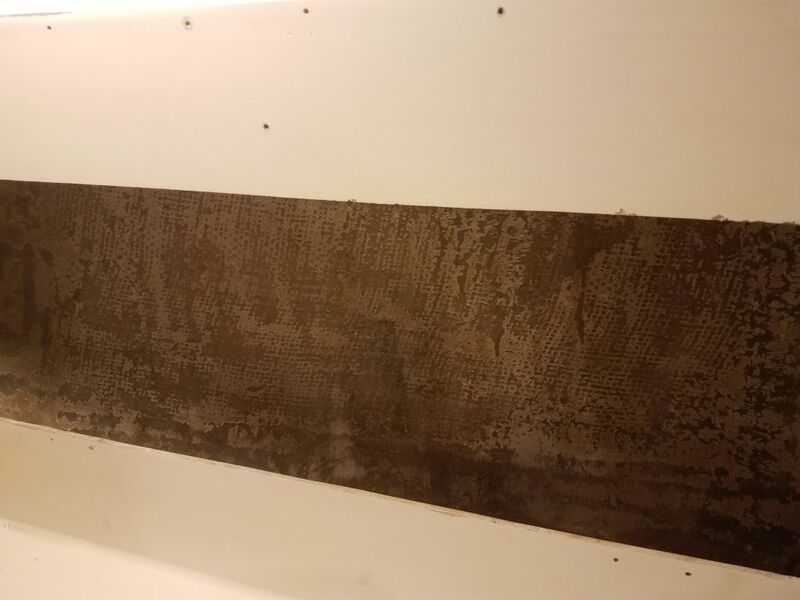 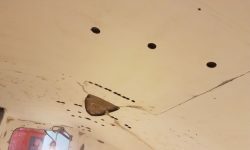 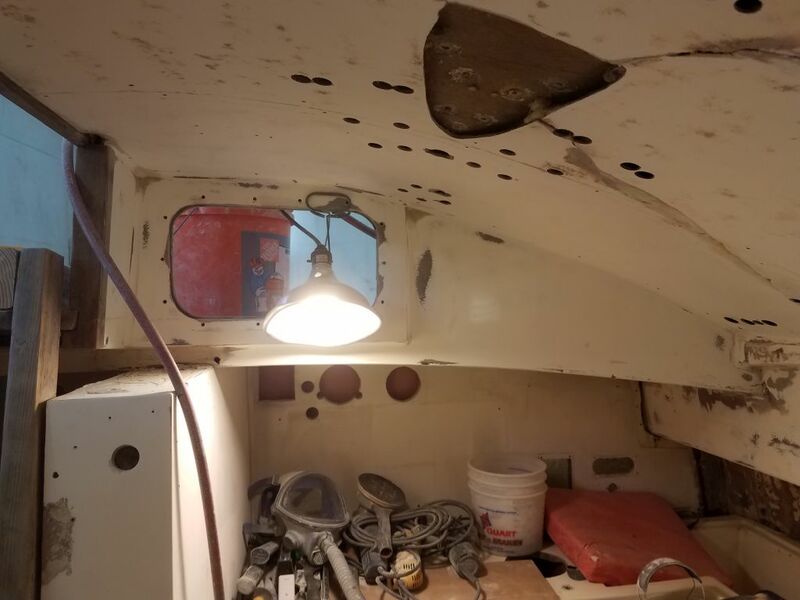 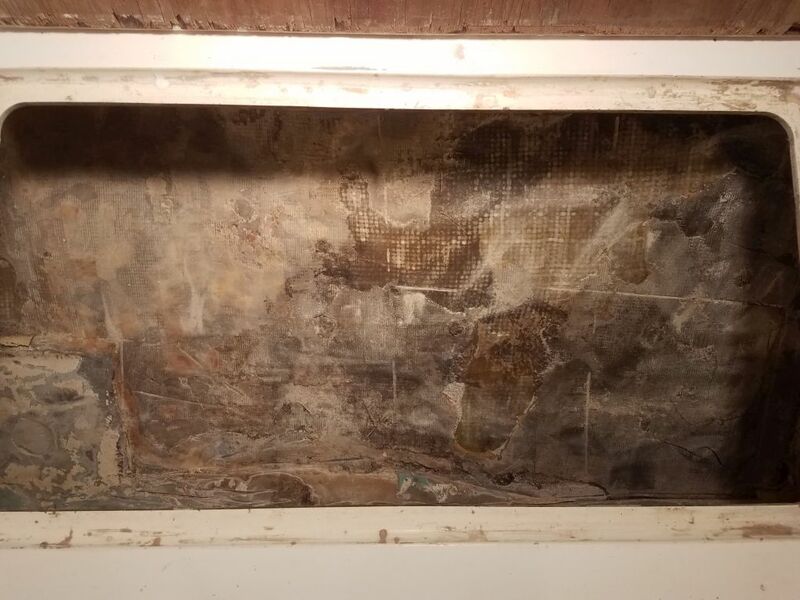 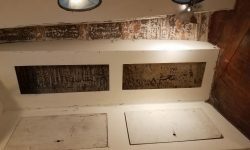 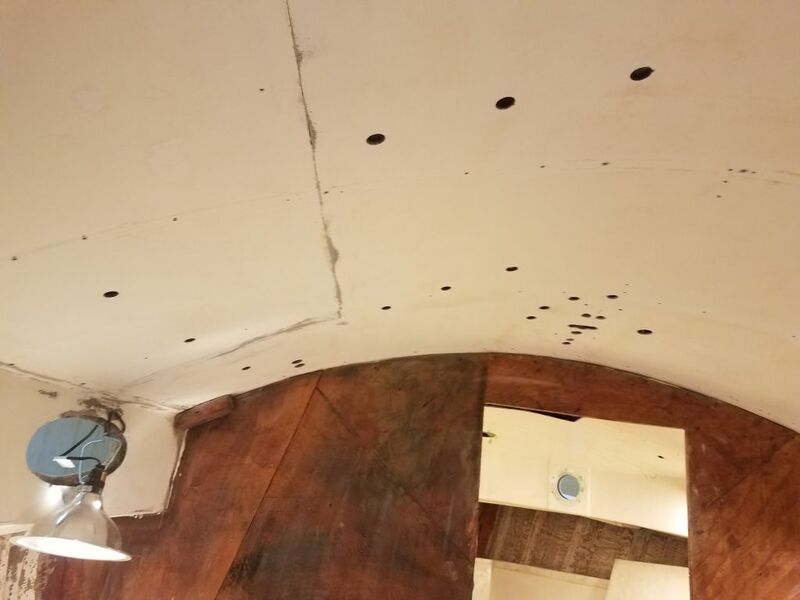 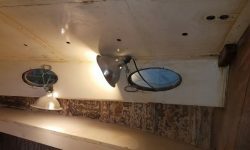 The molded overhead was pockmarked with holes from hardware installations above, as well as a nightmare area above the galley where various old work had occurred. 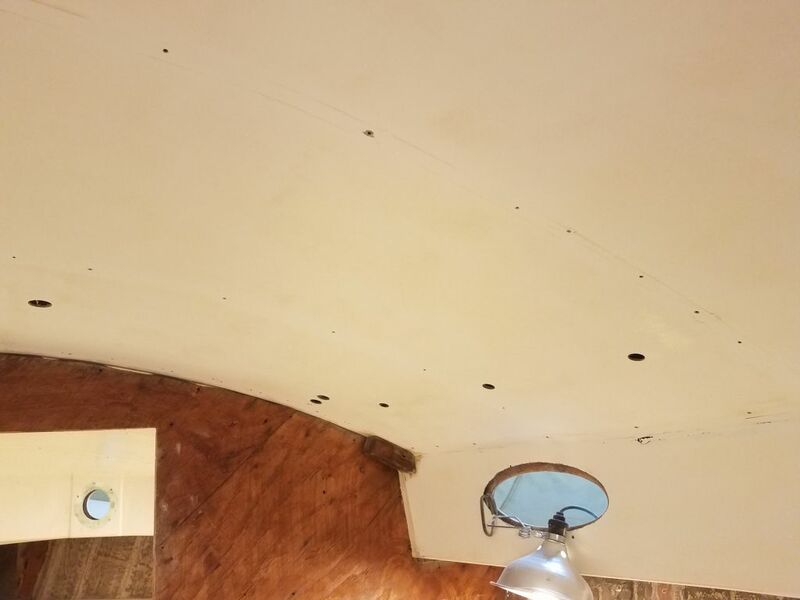 This overhead was never going to be the final surface in the new interior, but I felt it was still necessary to sand it with coarse paper to clean, degloss, and abrade the surface so it would be ready for whatever future treatments I might do. 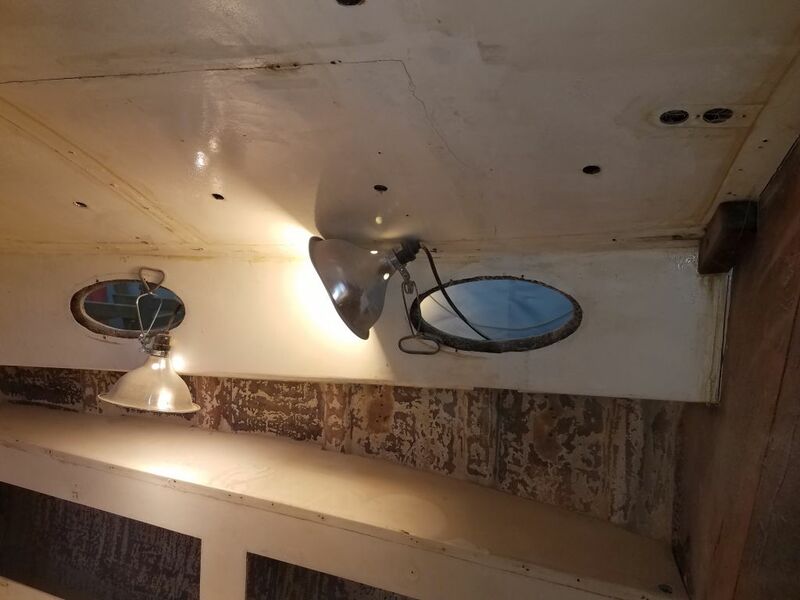 The overhead was also too ugly to live, and after all, I had to work in this space for some months. 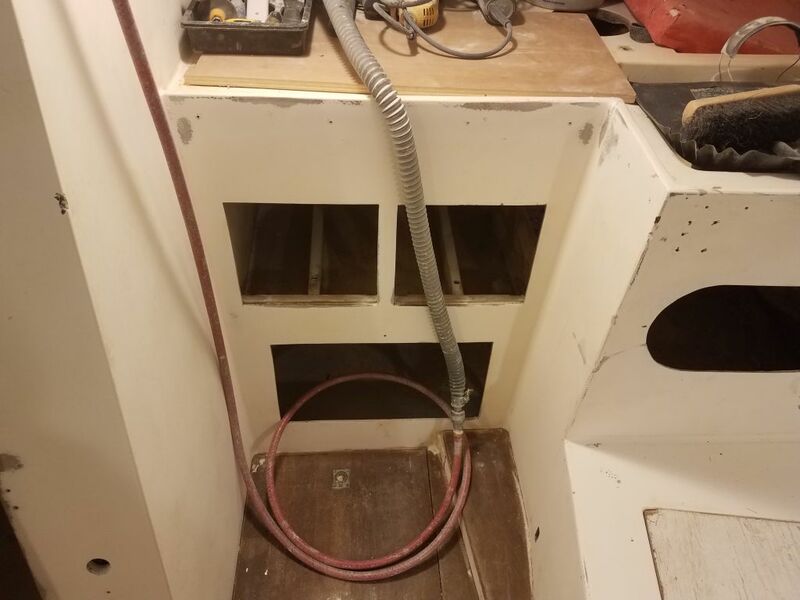 A happy boat restorer is…well, happy. 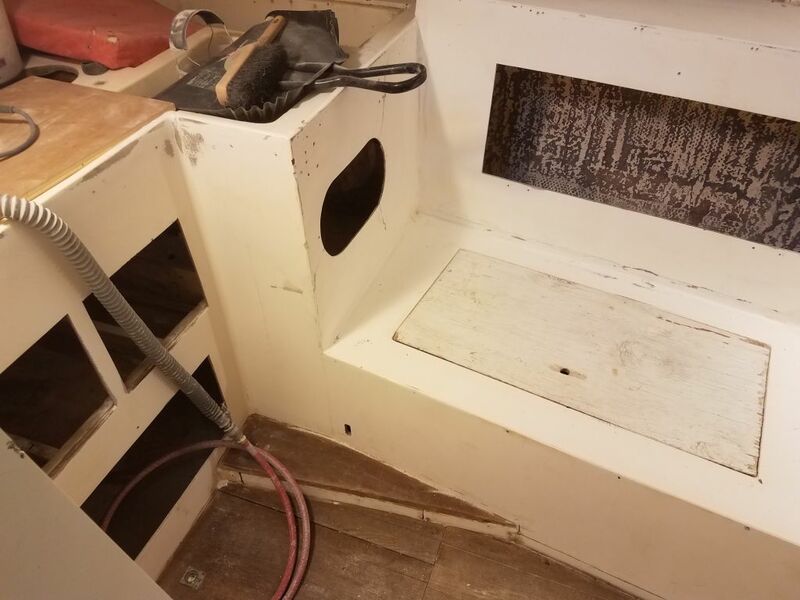 It just felt better in the boat after I’d sanded the overhead clean. 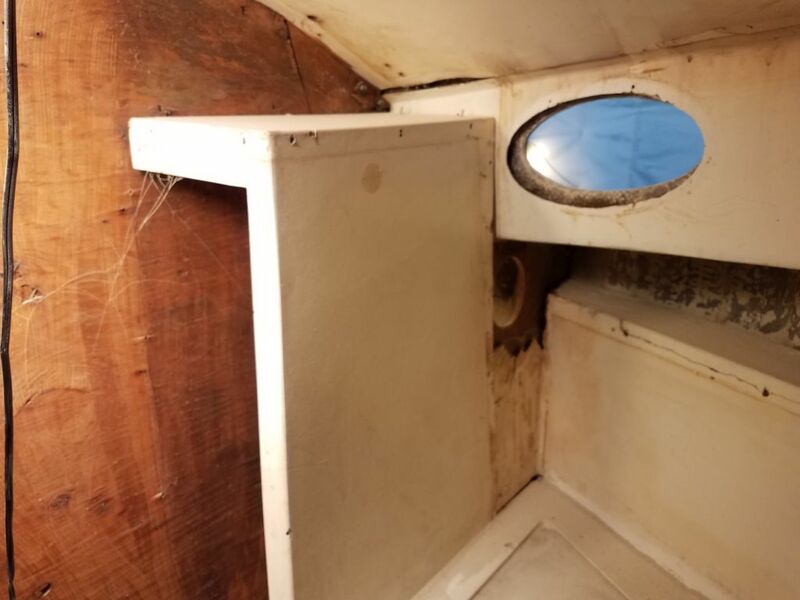 I cleaned up the dust and detritus from the past two days’ sanding, and looked forward to repeating the process in the forward cabin next time.